The Philippine Association of Wedding Planners (PAWP) is eyeing the country to be the wedding destination of neighboring Asian countries, PAWP president Liza Alviedo said in a press briefing in Makati City Monday. Alviedo said the Philippines has a big opportunity in the wedding industry as getting married in the country is cheaper compared to other countries in the region. For instance, the lowest wedding cost in Singapore is at 10,000 Singaporean dollars which can accommodate 20 to 30 guests only. But in the Philippines setting, a marrying couple can only spend 20 percent of the wedding cost in Singapore with the same number of guests. 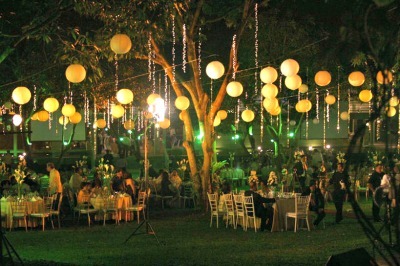 Alviedo added that the country also has an advantage with its scenic views perfect as wedding venues. In line with this, the PAWP asked the tourism department’s support as the wedding industry can also boost the tourism sector here. She also mentioned that the Philippines has very good supply of talents like wedding coordinators, make-up artists, designers, and production team, among others; hence, giving a value for money. In order to tap markets abroad, the PAWP together with Destination Events and Business Solutions (DEBS) will hold Philippine Wedding Expo at Singapore in July 27 to 28 at the Atrium Ball, Raffles City Convention Center, Singapore. Alviedo explained that the wedding expo aims to tap Filipinos in Singapore to still choose Philippines as their wedding destination. The Philippine wedding industry considers Singapore as a key market as there are 190,000 Filipinos in Singapore of which 110,000 are working professionals. Many Filipinos in Singapore are also in the marrying age bracket of 26 to 29 years old. Also, Filipinos working in Singapore also have strong spending power which makes them willing to spend more for their weddings. Further, PAWP and DEBS will bring around 50 wedding suppliers in the expo in Singapore composed of entities from fashion design, photography, videography, event styling, catering, jewelry, hotels, resorts, bridal make-up, invitation, cake, wine, mobile bar, musicians, reception venues, and wedding coordination. PAWP and DEBS expects at least 600 registrants for the said wedding expo in Singapore. According to the PAWP, the wedding industry in the Philippines has an annual worth of at least Php 1 billion. Within Asia, the country's competitor in this industry is Indonesia as the said country has easier process to acquire wedding documents.